Have you heard that Australia’s No.1 fashion magazine Marie Claire released their 200th edition issue this month? That is a milestone that deserves a mention and celebration in the form of a street party!! 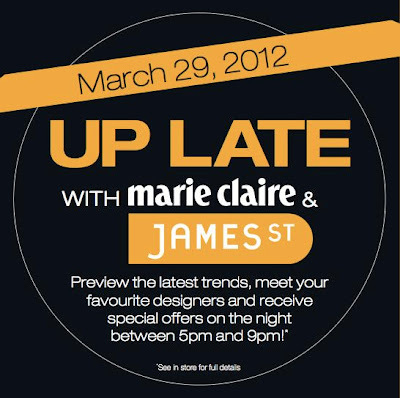 This Thursday the 29th of March will see the Marie Claire & James Street Up Late event in Fortitude Valley, Brisbane. Maire Claire Editor Jackie Frank and her lifestyle and fashion crew will also be present alongside fashion designers Heidi Middleton (Sass & Bide), Easton Pearson’s Pamela Easton and Lydia Pearson (Easton Pearson), Camilla Franks (Camilla), Bec Manning (Rebecca Manning) and the boys from KSUBI, just to name a few! There will be a exciting in-store offers, bubbles and nibbles to swift your feet through the ultimate street party!! Are you going to attend the UP LATE Event this Thursday?